If there’s anything Smash Bros. has taught me, it’s that Fire Emblem exists, and that frying pans are perfectly viable weapons at times. But sometimes they’ll be golf clubs or mushroom men!…Smash Bros. is weird. Metal Frying Pan is a Tool that can be utilized by Metal Pokemon. It has that classy damage reduction effect that a lot of Metal support cards like to use, this time lowering the damage by 30, but it also has the advantage of removing Weakness, which is usually going to be Fire. Needless to say, the damage reduction is pretty significant, and removing the Fire weakness can give Metal decks an even footing against Fire decks which will have to actively try and get to their strongest moves in order to beat them. And Fire decks right now are in a pretty sorry state, outside of Volcanion which is on the cusp of rotation. Even without the removal of weakness, the damage reduction will be enough to warrant a few 2HKOs being pushed to 3HKOs, saving a lot of effort on the part of the Metal deck. The only question then becomes if it’s worth reducing the effectiveness of your opponent’s moves to work with your own, or if it’s better to go with something like Choice Band to get rid of problems faster. Given the current state of Standard, I’d hazard to say that it’s probably more necessary to run Metal Frying Pan than it is a choice. Counteracting your opponent’s Choice Band can put you in a better position, Psychic decks won’t really be able to work against it (and they’re likely big thanks to things like Buzzwole-GX), and it lets you progress your plays at your own pace. So definitely a big check on Metal Frying Pan there! Arora Notealus: It’s actually pretty flavorful, since metal frying pans are used in cooking a lot, which introduces the element of fire. I guess it’s cause the metal in the pan is made more to absorb the heat rather than to…uhhh…melt with it? But then again stoves don’t reach temperatures high enough to melt metal…and if they did, it’s cause they’re molding it into things like pans…hmmmm…it makes sense that frying pans remove fire weakness, right? Side Review: Purugly – a good disruptive option against Stadiums and hands, Purugly could lead to a good combination with things like Garbodor, fueling up the opponent’s discard pile with stuff before unleashing a powerful Trashalanche. The problem comes mainly from her attacks being too slow and too weak on their own. Toss Aside would be great if it wasn’t 3 Energy, and Own the Place only works against Stadiums! It’s likely the reason Purugly’s come up just short in competition. Next Time: A long-necked Pokemon arises to rear its head as a challenge! Who would’ve thought that a kitchen appliance would be used as a weapon or a shield? Maybe it was a thing back then if we’re talking about 70+ years ago. 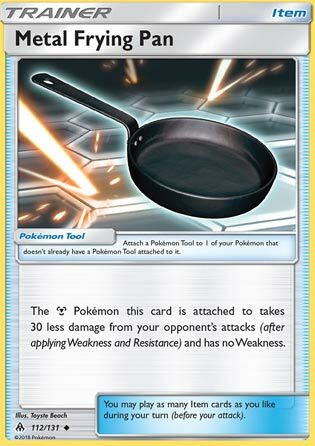 Enter Metal Frying Pan, a Pokémon Tool card that works for Metal Pokemon. Metal Pokemon takes 30 less damage and has no weakness. The bulkiest Metal Pokemon would be either Metagross-GX or Solgaleo-GX, whose 250 HP backed with Metal Frying Pan means that your opponent has to hit the full 280 damage to land a OHKO. The effects are nice and could be a must run in Metal decks, but it can be played around with Field Blower to remove that tool, then Metal Pokemon would be vulnerable again. Not to mention that there are very few cards that can still penetrate even past the effects of this tool: Charizard’s Crimson Storm, or Dusk Mane Necrozma’s Solar Eclipse backed with Beast Energy or Choice Band (yes, they can go extreme lengths to secure that KO). I really want to like this card, but every other problem doesn’t seem to go away. Each attack is reduced by thirty – meaning if the attacking Pokemon’s base damage is 150 or less, you three hit KO Solgaleo GX or Metagross GX… IF they don’t have a Max Potion. Although Fire decks seem to be falling out of popularity (I’ve gone up against seven Fire decks in 213 matches so far this month), anytime you don’t have to worry about weakness is a bonus. I’m 4 W 17 L when I have weakness this month. This will also protect against bench sniping as well (it just says “Opponent’s attacks” – it says nothing about being the active Pokemon). So this card is like an Assault Vest, Weakness Policy, and Mr. Mime all wrapped up in one card. THIS is what I’m talking about when I ask for Pokemon to give us good cards, cards that add some flavor to the game, cards that do more than just one little thing. This does three little things, but the little things add up. Granted, its Metal type limitation significantly limits the scope of this card’s use, but it gives us some variety and something to definitely think about when we run Metal archetypes. I tried this in a Solgaleo GX Solgaleo Prism deck. I went up against a Buzzwole GX and he hit me with an Absorption GX when he still had six prizes left… and that’s when I realized that this card is bugged on PTCGO. While his Absorption GX only hit me for 240 (ten short of KO’ing me), it should have hit me for only 210. It’s disappointing that this card is currently not working correctly, and I’ll have to continue to test it at a later time. In this one match I played with it, it didn’t make a difference on his Absorption GX in this case BUT might have if he had a Strong Energy and Diancie Prism in play. Later, on a different Solgaleo GX with another Frying Pan, my opponent used his Leaf Blower to knock it off. In these two cases, Metal Frying Pan did not help me in the least. However, that’s only two situations, and it very well could have made a difference in that first case had my opponent had a couple of damage enhancers in play. I was going to give it a N/A because I didn’t really get to test it, but I decided to give it a two out of five mostly because of its limited scope. Once it gets functioning properly on PTCGO, it’s definitely worth trying to see if it can help Metal Pokemon, especially those behemoths Solgaleo GX and Metagross GX. I played a TON of Pokemon this weekend and posted my Sylveon list that I went 18 W 6 L with here. If you’re looking for the best disruption deck in the game today, I think this is it.